"I need to know if I can backup only WeChat messages on iPhone X? I asked many friends but of no help. That’s why I’m here. Any advice please!" 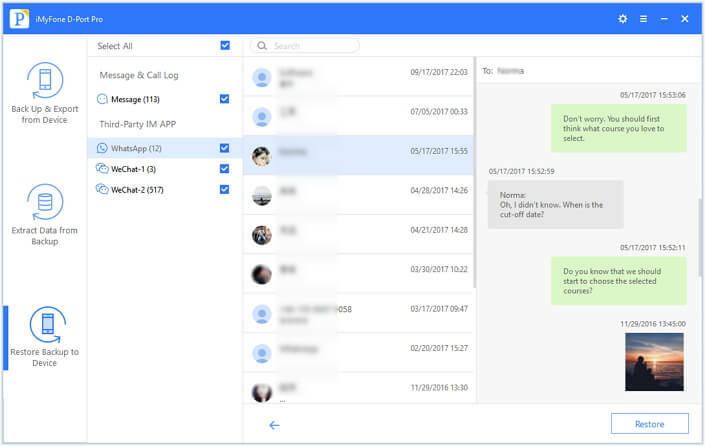 WeChat is a powerful app that offers texting, sharing photos and videos, sending/receiving voice messages and many more features. 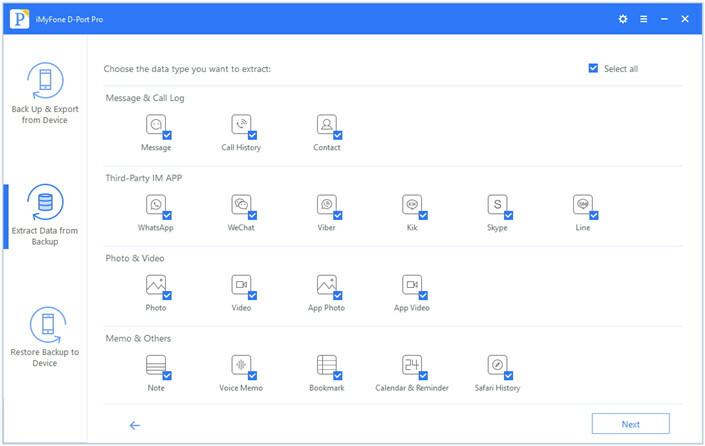 Making a backup of WeChat Messages is always a very important part when we are using WeChat in order to avoid data loss. With the launch of iPhone 8 and iPhone X, many iphone lovers are preparing to change their iPhone. Therefore, we reached here to tell you how to backup only WeChat messages on iPhone X/iPhone 8. Lets’ begin! 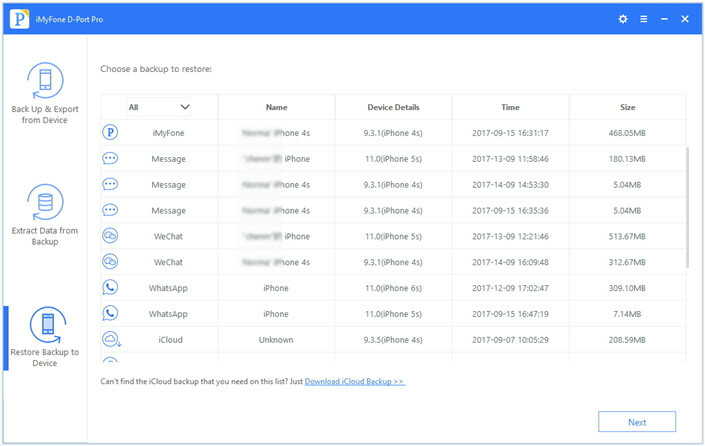 To backup only WeChat messages on iPhone X/iPhone 8, all you need is a professional backup and restore tool -- iMyFone D-Port Pro. It is one of the most excellent programs that helps the users to selectively backup their data on their iPhone. You are allowed to backup only WeChat messages, WhatsApp messages, messages (imessages) on your iPhone. You can use it even if you are running iOS 11. D-Port Pro can help in making a full backup of iPhone or just backup iPhone partially. All the backup files made by iMyFone D-Port Pro will not be overwritten. With the help of this tool, you can also restore your iPhone selectively. For example, you can restore only contacts, messages, WeChat messages, WhatsApp messages to your device from the backup made by iTunes, iCloud, or iMyFone D-Port Pro. Once you make a backup, you can view it with the help of this tool. 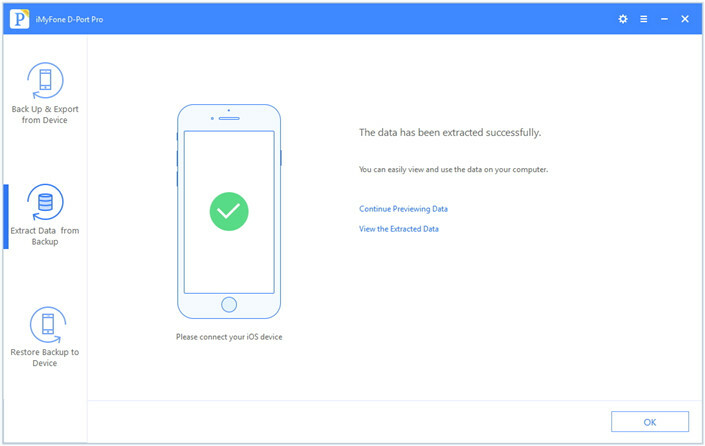 You can also use this program to extract more than 20 types of data from the backup files or your iPhone/iPad/iPod. Enough of talking now, let’s get to some practical stuff. Let’s now understand how to backup only WeChat messages on iPhone X/iPhone 8. Before proceeding make sure your device is properly connected to the computer. Meanwhile, get the iMyFone D-Port Pro from its official website and install it on your device. Step 1 – Launch the software and tap on "Backup & Export from Device" tab in the left panel. Next, you have to tap on "Backup WeChat" option from the screen. 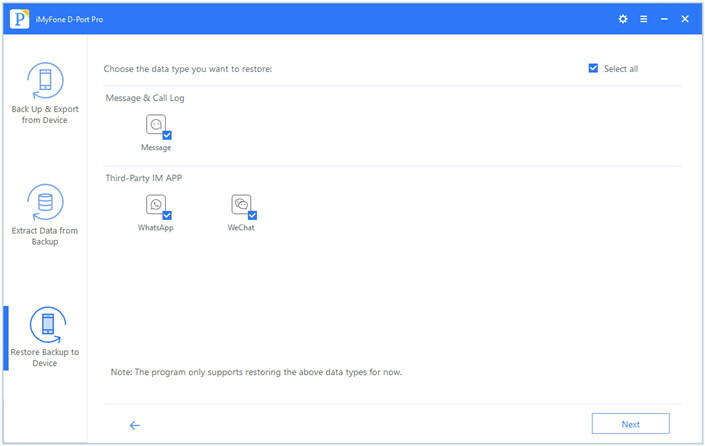 Step 2 – You can now start the process to backup your WeChat data by clicking on "Backup" button. Step 3 – Upon successfully backing up your data, software will notify you when the process is completed. Meanwhile, do not disconnect your device from the computer. To perform backup of only WeChat messages on iPhone X/iPhone 8 is extremely easy using iMyFone D-Port Pro, right? So is restoring the WeChat messages backup to your iPhone X/iPhone 8. Moreover, you can also restore only WeChat messages from any of the backup files made with iTunes, iCloud or iMyFone D-Port Pro. Let’s catch the glimpse of it too. 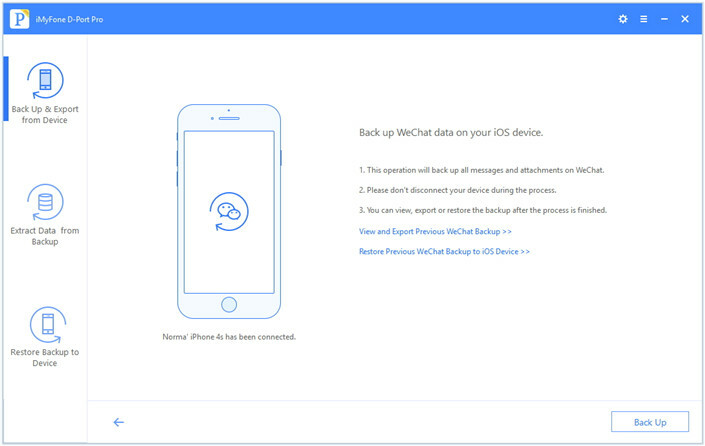 Here we are going to restore WeChat data from an iCloud backup file. Step 1 – Launch the iMyFone D-Port Pro software on your PC and get into the "Restore Backup to Device" tab on the left panel. Now select the iCloud backup listed on the backup file chart screen. If your iCloud backup isn’t listed on the screen, download it by tapping on the hyperlink "Download iCloud Backup". 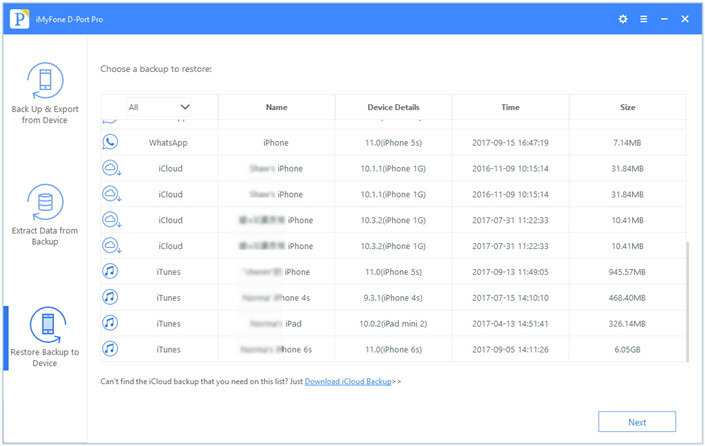 Step 2 – Next, sign in to your iCloud Account and choose an iCloud backup in your account. Then click "Next" to proceed. After that, you need choose the data type that you want to restore. Here we choose "WeChat" and then click "Next". Then the program will start to download the backup. 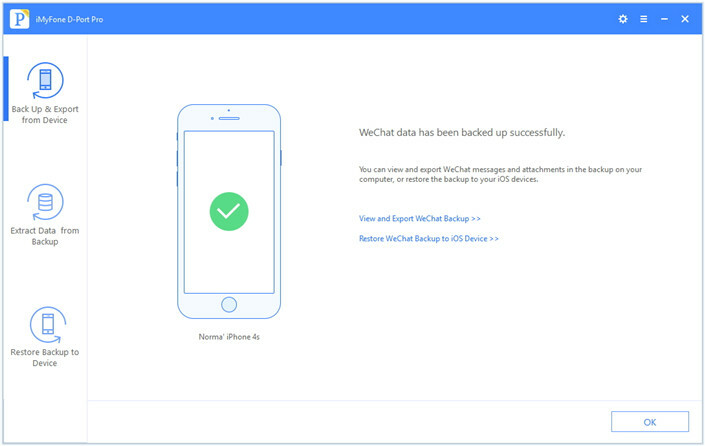 Step 3 – You can preview the WeChat messages in the backup after the downloading. Now, tap on "Restore" button after confirming that the WeChat messages are what you want to restore. Within a few minutes, your WeChat data will be restored to your iPhone X/iPhone 8. 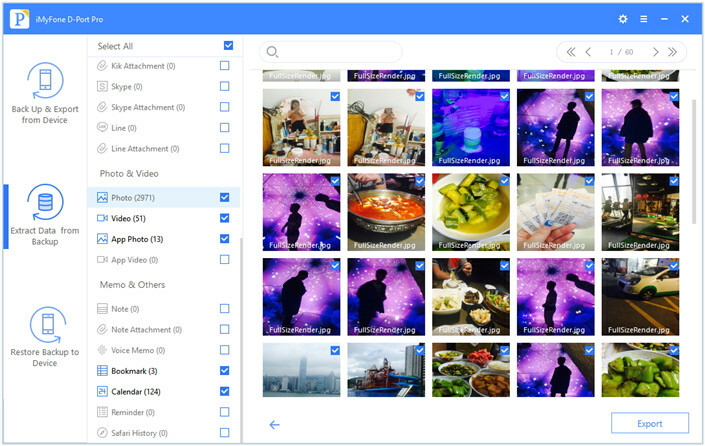 It is a known fact that iTunes and iCloud have some limitations, for instance, if you wish to extract certain type of data out of their respective backup files, you won’t be able to do it because they simply don’t offer you that flexibility and you are not even allowed to view the data in the backup files. You would have to restore the whole data instead if you want to view the backup. 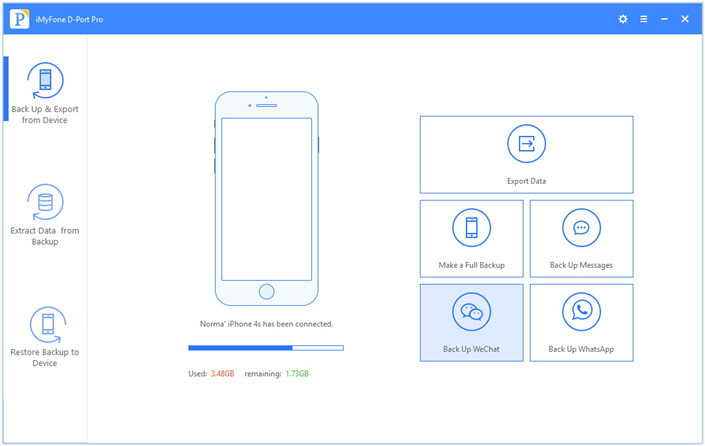 Fortunately, the amazing software iMyFone D-Port Pro not just enables you to view the data in the backup files without restoring the backup to your iPhone X/iPhone 8, but also offers you the desired flexibility to extract certain data out of iTunes/iCloud/iMyFone backup file. Sounds good? Let’s discover how to do it. 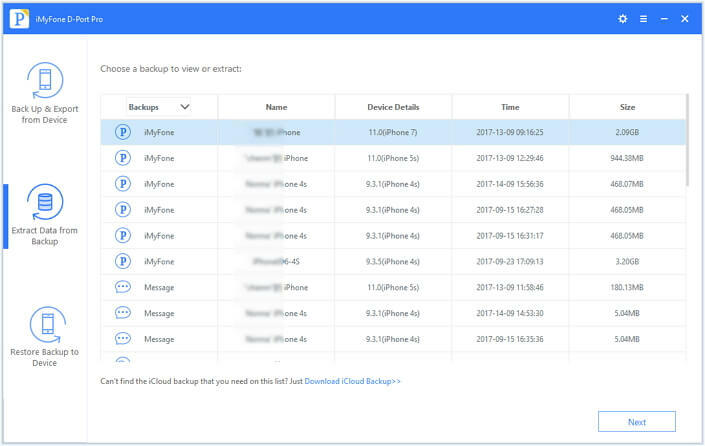 Step 1 – Launch the iMyFone D-Port Pro software and hit the "Extract Data from Backup" tab and select the iTunes/iCloud/iMyFone backup from which you wish to extract data and then hit "Next". Step 2 – Now, choose the data type you wish to extract from the backup file, i.e. WeChat, and hit "Next". It will then start analyzing the data and will display the results pretty soon. Step 3 – Lastly, select the files or items you need to extract out and hit "Extract". You data will then be extracted to your computer in a short while. Sometimes, we are only in need of backing up a specific data and that bothers us many times. We have make it clear to backup only WeChat messages on iPhone X/iPhone 8. We also provided you guides of restoring iPhone X or iPhone 8 from various backup files. Hope you can better manage the data of your iPhone.